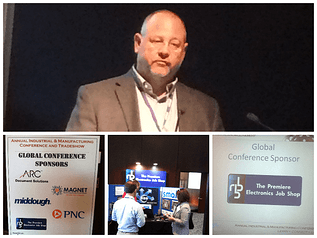 RBB recently served as a Global Sponsor and Exhibitor at the Cleveland Engineering Society's Annual Industry and Manufacturing Conference held at Lorain Community College's Spitzer Conference Center. RBB President and CEO, Bruce Hendrick introduced the morning keynote speaker, Matthew Hlavin, President and CEO of Thogus/rp+m/Jalex Medical and his session, "Corporate Engagement with Universities: The Responsibility to Help Build our Next Generations of Employees." The afternoon keynote speaker included Dr. Roy Church, President of Lorain Community College and his session, "Higher Education’s Role in Developing the Future Workforce." In addition to exhibitions, robotics displays, and a networking ceremony and reception, attendees of the Cleveland Engineering Society's Annual Industry and Manufacturing Conference were given the option of choosing different sessions from four different tracks, including Innovation, People, Resources and FAB LAB Workshops. RBB is proud to have been a sponsor of this innovative conference alongside ARC Document Solutions, Best Technology, Boundary Systems, Jalex Medical, Lorain County Community College, MAGNET, Middough, PNC, RAF Automation, Sanctuary Software, and SE Blueprint. The Cleveland Engineering Society is a non-profit professional development organization that serves the needs of engineering and technical professionals and their employers by providing valued and topical speaker series and conferences, professional testing review courses, and networking and leadership opportunities. Learn more here.